The simple turnout frog is a device to enable the wheels running on one track to cross the rail of a diverging track. It provides continuous channels for the wheel flanges, and supports the wheels over the intersection of the flangeways. Constructed of carbon steel rails with rolled cast fillers, securely bolted together. While this type of construction may vary from heavy to extremely light duty, the rolled steel rails receive the full impact and wear. Designed for maximum severity of service, the incorporate a cast manganese steel center, designed to receive the full impact and wear through the intersection. 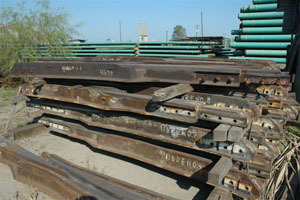 Rolled carbon steel rails support the manganese steel center, with arms extending to a point where conventional splices may be able to connect to the rails. All components, including the fillers, are securely bolted with heat treated bolts. Generally used on main lines where the turnout runs is infrequently used. Eliminating the open flangeway in the turnout run reduces impact and ear at the point, and provides smoother operation in the mainline. Completely integrated frogs, cast in one piece from manganese steel. Such a frog is designed to receive the connecting rails so necessary straps and special length bolts are furnished with the frog. The standard joint bars are usually supplied by the user. Self Guarded Frogs are similar to solid manganese steel frogs, with the addition of raised guards, cast integrally with the frog body. They are designed to guide the wheel flanges past the frog point. Solid manganese self guarded frogs can be used to eliminate the cost of guard rail installation and maintenance in yard tracks and terminals where speeds are moderate and traffic is heavy.